2 ml of solution for injection contains 100 mg of amikacin (as sulphate). 1 vial of 2 ml of solution for injection contains 500 mg of amikacin (as sulphate). Amikacin Injection is a semi-synthetic, aminoglycoside antibiotic which is active against a broad spectrum of Gram-negative organisms, including pseudomonas and some Gram-positive organisms. Sensitive Gram-negative organisms include; Pseudomonas aeruginosa, Escherichia coli., indole-positive and indole-negative Proteus spp., Klebsiella, Enterobacter and Serratia spp., Minea-Herralae, Citrobacter freundii, Salmonella, Shigella, Acinetobacter and Providencia spp. Many strains of these Gram-negative organisms resistant to gentamicin and tobramycin show sensitivity to amikacin in vitro. The principal Gram-positive organism sensitive to amikacin is Staphylococcus aureus, including some methicillin-resistant strains. Amikacin has some activity against other Gram-positive organisms including certain strains of Streptococcus pyogenes, Enterococci and Diplococcus pneumoniae. Amikacin is indicated in the short-term treatment of serious infections due to susceptible strains of Gram-negative bacteria, including Pseudomonas species. Although amikacin is not the drug of choice for infections due to staphylococci, at times it may be indicated for the treatment of known or suspected staphylococcal disease. These situations include: the initiation of therapy for severe infections when the organisms suspected are either Gram-negative or staphylococci, patients allergic to other antibiotics, and mixed staphylococcal/Gram-negative infections. Therapy with amikacin may be instituted prior to obtaining the results of sensitivity testing. Surgical procedures should be performed where indicated. Amikacin sulphate injection may be given intramuscularly or intravenously. Amikacin should not be physically premixed with other drugs, but should be administered separately according to the recommended dose and route. The patient’s pre-treatment bodyweight should be obtained for calculation of correct dosage. Whenever possible, amikacin concentrations in serum should be measured to assure adequate, but not excessive levels. It is desirable to measure both peak and trough serum concentrations intermittently during therapy. Peak concentrations (30-90 minutes after injection) above 35 mcg/ml and trough concentrations (just prior to the next dose) above 10 mcg/ml should be avoided. Dosage should be adjusted as indicated. In patients with normal renal function, once-daily dosing may be used; peak concentrations in these cases may exceed 35 mcg/ml. For most infections the intramuscular route is preferred, but in life-threatening infections, or in patients in whom intramuscular injection is not feasible, the intravenous route, either slow bolus (2 to 3 minutes) or infusion (0.25% over 30 minutes) may be used. At the recommended dosage level, uncomplicated infections due to sensitive organisms should respond to therapy within 24 to 48 hours. If clinical response does not occur within three to five days, consideration should be given to alternative therapy. If required, suitable diluents for intravenous use are: Normal saline, 5% dextrose in water. Once the product has been diluted the solution must be used as soon as possible and NOT STORED. The recommended intramuscular or intravenous dosage for adults and adolescents with normal renal function (creatinine clearance ≥50 ml/min) is 15 mg/kg/day which may be administered as a single daily dose or divided into 2 equal doses i.e. 7.5 mg/kg q 12 h. The total daily dose should not exceed 1.5 g. In endocarditis and in febrile neutropenic patients, dosing should be twice daily, as there is not enough data to support once daily dosing. The recommended intramuscular or intravenous (slow intravenous infusion) dose in children with normal renal function is 15-20 mg/kg/day which may be administered as 15-20 mg/kg, once a day; or as 7.5 mg/kg q 12 h. In endocarditis and in febrile neutropenic patients dosing should be twice daily, as there is not enough data to support once daily dosing. An initial loading dose of 10 mg/kg followed by 7.5 mg/kg q 12 h (see sections 4.4 and 5.2). The recommended dose in prematures is 7.5 mg/kg in every 12 hours (see sections 4.4 and 5.2). The usual duration of treatment is 7 to 10 days. The total daily dose by all routes of administration should not exceed 15-20 mg/kg/day. In difficult and complicated infections where treatment beyond 10 days is considered, the use of amikacin sulphate injection should be re-evaluated and, if continued, renal, auditory, vestibular function should be monitored, as well as serum amikacin levels. If definite clinical response does not occur within 3 to 5 days, therapy should be stopped and the antibiotic susceptibility pattern of the invading organism should be rechecked. Failure of the infection to respond may be due to resistance of the organism or to the presence of septic foci requiring surgical drainage. The solution is administered to adults over a 30 to 60 minute period. In paediatric patients the amount of diluents used will depend on the amount of amikacin tolerated by the patient. The solution should normally be infused over a 30 to 60 minute period. Infants should receive a 1 to 2 hour infusion. Amikacin is excreted by the renal route, renal function should be assessed whenever possible and dosage adjusted as described under impaired renal function. The adult dose may be increased to 500 mg every eight hours but should never exceed 1.5 g/day nor be administered for a period longer than 10 days. A maximum total adult dose of 15 g should not be exceeded. 7.5 mg/kg/day in two equally divided doses (equivalent to 250 mg b.i.d. in adults). As the activity of amikacin is enhanced by increasing the pH, a urinary alkalinising agent may be administered concurrently. In patients with renal impairment reflected by creatinine clearance less than 50 mL/min, administration of the recommended total daily dose of amikacin in single daily doses is not desirable since these patients will have protracted exposure to high trough concentrations. See below for dosage adjustments in patients with impaired renal function. For patients with impaired renal function receiving usual twice or three times daily dosing, whenever possible, serum amikacin concentrations should be monitored by appropriate assay procedures. Doses should be adjusted in patients with impaired renal function either by administering normal doses at prolonged intervals or by administering reduced doses at fixed intervals. Both methods are based on the patient’s creatinine clearance or serum creatinine values since these have been found to correlate with aminoglycoside half-lives in patients with diminished renal function. These dosage schedules must be used in conjunction with careful clinical and laboratory observations of the patient and should be modified as necessary, including modification when dialysis is being performed. Normal Dose at Prolonged Intervals Between Dosing: If the creatinine clearance rate is not available and the patient’s condition is stable, a dosage interval in hours for the normal single dose (ie, that which would be given to patients with normal renal function on a twice daily schedule, 7.5 mg/kg) can be calculated by multiplying the patient’s serum creatinine by nine; eg, if the serum creatinine concentration is 2mg/100mL, the recommended single dose (7.5 mg/kg) should be administered every 18 hours. As renal function may alter appreciably during therapy, the serum creatinine should be checked frequently and the dosage regimen modified as necessary. Reduced Dose at Fixed Time Intervals Between Dosing: When renal function is impaired and it is desirable to administer amikacin sulfate injection at a fixed time interval, dose must be reduced. In these patients, serum amikacin concentrations should be measured to assure accurate administration and to avoid excessive serum concentrations. If serum assay determinations are not available, and patient’s condition is stable, serum creatinine and creatinine clearance values are the most readily available indicators of the degree of renal impairment to use as a guide for dosage. First initiate therapy by administering a normal dose, 7.5 mg/kg, as a loading dose. This dose is the same as the normally recommended dose which would be calculated for a patient with a normal renal function as described above. An alternate rough guide for determining reduced dosage at 12-hour intervals (for patients whose steady state serum creatinine values are known) is to divide the normally recommended dose by the patient’s serum creatinine. The above dosage schedules are not intended to be rigid recommendations, but are provided as guides to dosage when the measurement of amikacin serum levels is not feasible. Following exploration for established peritonitis, or after peritoneal contamination due to faecal spill during surgery, amikacin may be used as an irrigant after recovery from anaesthesia in concentrations of 0.25% (2.5 mg/ml). The intraperitoneal use of amikacin is not recommended in young children. Amikacin in concentrations 0.25% (2.5 mg/ml) may be used satisfactorily as an irrigating solution in abscess cavities, the pleural space, the peritoneum and the cerebral ventricles. 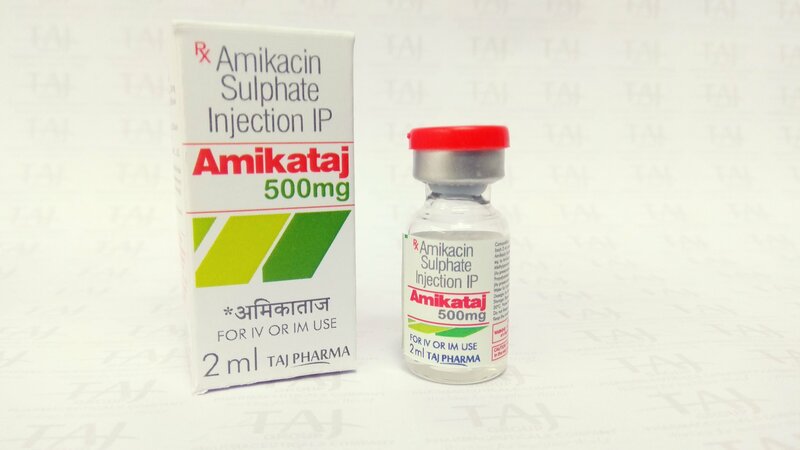 Amikacin sulphate injection is contraindicated in patients with known allergy to amikacin or any component of the formulation. A history of hypersensitivity or serious toxic reactions to aminoglycosides may contraindicate the use of any aminoglycoside because of the known cross sensitivities of patients to drugs in this class. Aminoglycosides may impair neuromuscular transmission, and should not be given to patients with myasthenia gravis. Patients should be well hydrated during amikacin therapy. Caution should be applied to patients with pre-existing renal insufficiency, pre-existing hearing or vestibular damage and diminished glomerular filtration. Patients treated with parenteral aminoglycosides should be under close clinical observation because of the potential ototoxicity and nephrotoxicity associated with their use. Safety for treatment periods which are longer than 14 days has not been established. If therapy is expected to last seven days or more in patients with renal impairment, or 10 days in other patients, a pre-treatment audiogram should be obtained and repeated during therapy. Aminoglycosides are potentially nephrotoxic. Renal toxicity is independent of plasma obtained at the peak (Cmax). The risk of nephrotoxicity is greater in patients with impaired renal function, and in those who receive higher doses, or in those whose therapy is prolonged. Patients should be well hydrated during treatment and renal function should be assessed by the usual methods prior to starting therapy and daily during the course of treatment. A reduction of dosage is required if evidence of renal dysfunction occurs, such as presence of urinary casts, white or red cells, albuminuria, decreased creatinine clearance, decreased urine specific gravity, increased BUN, serum creatinine, or oliguria. If azotemia increases, or if a progressive decrease in urinary output occurs, treatment should be stopped. Elderly patients may have reduced renal function which may not be evident in routine screening tests such as BUN or serum creatinine. A creatinine clearance determination may be more useful. Monitoring of renal function in elderly patients during treatment with aminoglycosides is particularly important. Renal and eighth-cranial nerve function should be closely monitored especially in patients with known or suspected renal impairment at the onset of therapy, and also in those whose renal function is initially normal but who develop signs of renal dysfunction during therapy. Serum concentrations of amikacin should be monitored when feasible to assure adequate levels and to avoid potentially toxic levels. Urine should be examined for decreased specific gravity, increased excretion of proteins, and the presence of cells or casts. Blood urea nitrogen, serum creatinine, or creatinine clearance should be measured periodically. Serial audiograms should be obtained where feasible in patients old enough to be tested, particularly high risk patients. Evidence of ototoxicity (dizziness, vertigo, tinnitus, roaring in the ears, and hearing loss) or nephrotoxicity requires discontinuation of the drug or dosage adjustment. Concurrent and/or sequential, oral, or topical use of other neurotoxic or nephrotoxic products, particularly bacitracin, cisplatin, amphotericin B, cephaloridine, paromomycin, viomycin, polymyxin B, colistin, vancomycin, or other aminoglycosides, should be avoided. Other factors that may increase risk of toxicity are advanced age and dehydration. Patients suffering from pre-existing renal insufficiency should be assessed by the usual methods prior to therapy and periodically during therapy. Daily doses should be reduced and/or the interval between doses lengthened in accordance with serum creatinine concentrations to avoid accumulation of abnormally high blood levels and to minimise the risk of ototoxicity. Regular monitoring of serum drug concentration and of renal function is particularly important in elderly patients, who may have reduced renal function that may not be evident in the results of routine screening tests i.e. blood urea and serum creatinine. Neurotoxicity, manifested as vestibular and/or bilateral ototoxicity, can occur in patients treated with aminoglycosides. The risk of aminoglycoside-induced ototoxicity is greater in patients with impaired renal function, and in those who receive high doses, or in those whose therapy is prolonged over 5-7 days of treatment, even in healthy patients. High frequency deafness usually occurs first and can be detected only by audiometric testing. Vertigo may occur and may be evidence of vestibular injury. Other manifestations of neurotoxicity may include numbness, skin tingling, muscle twitching and convulsions. The risk of ototoxicity due to aminoglycosides increases with the degree of exposure to either persistently high peak or high trough serum concentrations. Patients developing cochlear or vestibular damage may not have symptoms during therapy to warn them of developing eighth nerve toxicity, and total or partial irreversible bilateral deafness or disabling vertigo may occur after the drug has been discontinued. Aminoglycoside-induced ototoxicity is usually irreversible. Neuromuscular blockade and respiratory paralysis have been reported following parenteral injection, topical instillation (as in orthopaedic and abdominal irrigation or in local treatment of empyema), and following oral use of aminoglycosides. The possibility of respiratory paralysis should be considered if aminoglycosides are administered by any route, especially in patients receiving anaesthetics, neuromuscular blocking agents such as tubocurarine, succinylcholine, decamethonium, atracurium, rocuronium, vecuronium or in patients receiving massive transfusions of citrate-anticoagulated blood. If neuromuscular blockade occurs, calcium salts may reverse respiratory paralysis, but mechanical respiratory assistance may be necessary. Neuromuscular blockade and muscular paralysis have been demonstrated in laboratory animals given high doses of amikacin. Amikacin must not be used in patients with myasthenia gravis. Aminoglycosides should be used with caution in patients with muscular disorders such as Parkinsonism since these drugs may aggravate muscle weakness because of their potential curare-like effect on the neuromuscular junction. The use of amikacin in patients with a history of allergy to aminoglycosides or in patients who may have subclinical renal or eighth nerve damage induced by prior administration of nephrotoxic and/or ototoxic agents such as streptomycin, dihydrostreptomycin, gentamicin, tobramycin, kanamycin, neomycin, polymyxin B, colistin, cephaloridine or viomycin should be considered with caution, as toxicity may be additive. In these patients amikacin should be used only if, in the opinion of the physician, therapeutic advantages outweigh the potential risks. Large doses of amikacin administered during surgery have been responsible for a transient myasthenic syndrome. Amikacin sulfate injection in vials contains sodium bisulfite, a sulfite that may cause allergic-type reactions including anaphylactic symptoms and life-threatening or less severe asthmatic episodes in certain susceptible people. The overall prevalence of sulfite sensitivity in the general population is uncommon and probably low. Sulfite sensitivity is seen more frequently in asthmatic than in non-asthmatic subjects. Aminoglycosides are quickly and almost totally absorbed when they are applied topically, except to the urinary bladder, in association with surgical procedures. Irreversible deafness, renal failure and death due to neuromuscular blockade have been reported following irrigation of both small and large surgical fields with an aminoglycoside preparation. As with other antibiotics, the use of amikacin may result in overgrowth of non-susceptible organisms. If this occurs, appropriate therapy should be instituted. Macular infarction sometimes leading to permanent loss of vision has been reported following intravitreous administration (injection into the eye) of amikacin. The concurrent or serial use of other neurotoxic, ototoxic or nephrotoxic agents, particularly bacitracin, cisplatin, amphotericin B, ciclosporin, tacrolimus, cephaloridine, paromomycin, viomycin, polymyxin B, colistin, vancomycin, or other aminoglycosides should be avoided either systemically or topically because of the potential for additive effects. Where this is not possible, monitor carefully. Increased nephrotoxicity has been reported following concomitant parenteral administration of aminoglycoside antibiotics and cephalosporins. Concomitant cephalosporin use may spuriously elevate creatinine serum level determinations. The concurrent use of amikacin sulfate injection with potent diuretics (ethacrynic acid or furosemide) should be avoided since diuretics by themselves may cause ototoxicity. In addition, when administered intravenously, diuretics may enhance aminoglycoside toxicity by altering antibiotic concentrations in serum and tissue. In Vitro admixture of aminoglycosides with beta-lactam antibiotics (penicillins or cephalosporins) may result in significant mutual inactivation. A reduction in serum activity may also occur when an aminoglycoside or penicillin-type drug is administered in vivo by separate routes. Inactivation of the aminoglycoside is clinically significant only in patients with severely impaired renal function. Inactivation may continue in specimens of body fluids collected for assay, resulting in inaccurate aminoglycoside readings. Such specimens should be properly handled (assayed promptly, frozen, or treated with beta-lactamase). There is an increased risk of hypocalcaemia when aminoglycosides are administered with bisphosphonates. There is an increased risk of nephrotoxicity and possibly of ototoxicity when aminoglycosides are administered with platinum compounds. Concomitantly administered thiamine (vitamin B1) may be destroyed by the reactive sodium bisulfite component of the amikacin sulfate formulation. The intraperitoneal use of amikacin is not recommended in patients under the influence of anaesthetics or muscle-relaxing drugs (including ether, halothane, d-tubocurarine, succinylcholine and decamethonium) as neuromuscular blockade and consequent respiratory depression may occur. Indomethacin may increase the plasma concentration of amikacin in neonates. There are limited data on use of aminoglycosides in pregnancy. Amnioglycosides can cause foetal harm. Aminoglycosides cross the placenta and there have been reports of total, irreversible, bilateral congenital deafness in children whose mothers received streptomycin during pregnancy. Although adverse effects on the foetus or newborns have not been reported in pregnant women treated with other aminoglycosides, the potential for harm exists. In reproduction toxicity studies in mice and rats no effects on fertility or foetal toxicity were reported. If amikacin is used during pregnancy or if the patient becomes pregnant while taking this drug, the patient should be apprised of the potential hazard to the foetus. It is not known whether amikacin is excreted in human milk. A decision should be made whether to discontinue breast-feeding or to discontinue therapy. Amikacin should be administered to pregnant women and neonatal infants only when clearly needed and under medical supervision (see section 4.4). The safety of amikacin in pregnancy has not yet been established. No studies on the effects on the ability to drive and use machines have been performed. Due to the occurrence of some adverse reactions (see section 4.8) the ability to drive and use machines may be impaired. This list is presented by system organ class, MedDRA preferred term, and frequency using the following frequency categories: very common (≥1/10), common (≥1/100, < 1/10), uncommon (≥1/1000, < 1/100), rare (≥1/10000, < 1/1000), very rare (<1/10000) and not known (cannot be estimated from the available data). bAmikacin is not formulated for intavitreal use. Blindness and retinal infarction have been reported following intravitreous admistrations (injection into the eye) of amikacin. Renal function changes are usually reversible when the drug is discontinued. Toxic effects on the eighth cranial nerve can result in hearing loss, loss of balance, or both. Amikacin primarily affects auditory function. Cochlear damage includes high frequency deafness and usually occurs before clinical hearing loss can be detected by audiometric testing (see section 4.4). When the recommended precautions and dosages are followed the incidence of toxic reactions, such as tinnitus, vertigo, and partial reversible deafness, skin rash, drug fever, headache, paraesthesia, nausea and vomiting is low. Urinary signs of renal irritation (albumin, casts, and red or white cells), azotaemia and oliguria have been reported although they are rare. In case of overdosage there is a general risk for nephro-, oto- and neurotoxic (neuromuscular blockage) reactions. Neuromuscular blockage with respiratory arrest needs appropriate treatment including application of ionic calcium (e.g. as gluconat or lactobionat in 10-20% solution) (see section 4.4). In the event of overdosage or toxic reaction, peritoneal dialysis or haemodialysis will aid in the removal of amikacin from the blood. Amikacin levels are also reduced during continuous arteriovenous hemofiltration. In the newborn infant, exchange transfusion may also be considered. Amikacin is a semi-synthetic aminoglycoside antibiotic derived from Kanamycin A. It is active against a broad spectrum of Gram-negative organisms, including pseudomonas, Escherichia coli and some Gram-positive organisms, e.g. Staphylococcus aureus. Aminoglycoside antibiotics are bactericidal in action. Although the exact mechanism of action has not been fully elucidated, the drugs appear to inhibit protein synthesis in susceptible bacteria by irreversibly binding to 30S ribosomal subunits. Amikacin is rapidly absorbed after intramuscular injection. Peak plasma concentrations equivalent to about 20 mg/ml are achieved one hour after IM doses of 500 mg, reducing to about 2 µg/ml 10 hours after injections. Twenty per cent or less is bound to serum protein and serum concentrations remain in the bactericidal range for sensitive organisms for 10 to 12 hours. Single doses of 500 mg administered as an intravenous infusion over a period of 30 minutes produce a mean peak serum concentration of 38 µg/ml. Repeated infusions do not produce drug accumulation in adults with normal renal function. However, decreased renal function will lead to accumulation. In adults with normal renal function the plasma elimination half-life of amikacin is usually 2-3 hours. 94 – 98% of a single IM or IV dose of amikacin is excreted unchanged by glomerular filtration within 24 hours. Urine concentrations of amikacin average 563 µg/ml in the first 6 hours following a single 250 mg IM dose and 163 µg/ml over 6-12 hours. Following a single 500 mg IM dose urine concentrations average 832 µg/ml in adults with normal renal function. Amikacin diffuses readily through extracellular fluids and is excreted in the urine unchanged, primarily by glomerular filtration. It has been found in pleural fluid, amniotic fluid and in the peritoneal cavity following parenteral administration. Data from multiple daily dose trials show that spinal fluid levels in normal infants are approximately 10 to 20% of the serum concntrations and may reach 50% in meningitis. In neonates and particularly in premature babies, the renal elimination of amikacin is reduced. In a single study in newborns (1-6 days of post natal age) grouped according to birth weights (<2000, 2000-3000 and >3000g). Amikacin was administered intramuscularly and/or intravenously at a dose of 7.5 mg/kg. Clearance in neonates >3000 g was 0.84 ml/min/kg and terminal half-life was about 7 hours. In this group, the initial volume of distribution and volume of distribution at steady state was 0.3 ml/kg and 0.5 mg/kg, respectively. In the groups with lower birth weight clearance/kg was lower and half-life longer. Repeated dosing every 12 hours in all the above groups did not demonstrate accumulation after 5 days. Amikacin is incompatible with some penicillins and cephalosporins, amphotericin chlorothiazide sodium, erythromycin gluceptate, heparin, nitrofurantoin sodium, phenytoin sodium, thiopentone sodium and warfarin sodium, and depending on the composition and strength of the vehicle, tetracyclines, vitamins of the B group with vitamin C, and potassium chloride. At times, amikacin may be indicated as concurrent therapy with other antibacterial agents in mixed or superinfections. In such instances, amikacin should not be physically mixed with other antibacterial agents in syringes, infusion bottles or any other equipment. Each agent should be administered separately. Prior to first use: 36 months. Prior to first use: Do not store above 25°C. In use: Following dilution in 0.9% sodium chloride and 5% glucose solutions chemical and physical in-use stability has been demonstrated for 24 hours at temperature not above 25°C. 500 mg/2 ml – clear Type I glass vial with rubber closure in packs of 1 vials. 100 mg/2 ml – clear Type I glass vial with rubber closure in packs of 1 vials. The solution may darken from colourless to a pale yellow but this does not indicate a loss of potency.